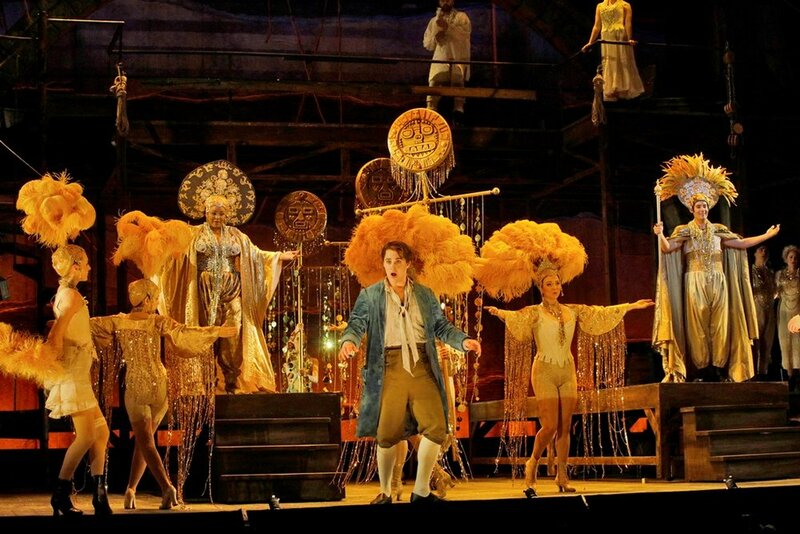 This “Candide” by L.A. Opera is the freshest, liveliest production I have seen in recent memory. Francesca Zambello’s memorable direction mixes side-splitting slapstick comedy with a beguiling El Dorado and a delightfully frightful auto-da-fé. Energetic production numbers by choreographer Eric Sean Fogel, Jennifer’ Moeller’s fanciful period costumes and Mark McCullough’s dramatic lighting effects all contribute mightily to the glitter and gaiety of the evening. The only disappointment was the set design which resembles uncomfortably last season’s “Tosca”, replete with a cluttered backstage set and a spiral staircase. The sets remain unchanged throughout the evening and could have benefited from video projections of the exotic world destinations mentioned in the story. Conductor James Conlon, opted for the Glimmerglas version with extra spoken dialogs for the secondary characters (Martin, Old Lady, etc. ), all for good fun. The music is a hybrid of Broadway show tunes and high-flying operatic arias with some intricate polyphonic ensembles foreign to the musical theater. The Act II finale, for example, is a virtuosic weaving of previously heard tunes and melodic fragments, all broken up and then magically transfigured into a whole new harmonic world. Soprano Erin Morley brings dizzying vocalism to Cunegonde’s showstopper ‘Glitter and Be Gay’. Behind her bravura technique is a voice of underlying vulnerability that helps humanize this somewhat shallow cardboard character. Candide is the most carefully-drawn character in the story. We witness his progression from an innocent wide-eyed young lad to a disillusioned man of the world who realizes “life goes on even in a less-than-perfect world”. Tenor Jack Swanson possesses a fine lyric voice, capable of expressing Candide’s wide range of emotions. TV star Kelsey Grammer sings and speaks the duo role of Dr. Pangloss and Voltaire (narrator) reasonably well for his first foray into opera. Broadway veteran Christine Ebersole is luxury casting as the campy one-buttocked Old Lady. Unlike the migration of opera stars to the silver screen and television in the 1950’s, today it’s the classical arts world that’s wooing Hollywood The formula worked so well, in fact, that an extra performance of “Candide” has been added. Peabody Southwell is a perky, coquettish Parquette. Theo Hoffman plays Cunegonde’s lunatic brother Maximilian delightfully. Joshua Wheeker is hilarious as Candide’s Spanish sidekick Cacambo. The excellent L.A. Opera Chorus sang with gusto in all the ensembles and almost religious fervor in the final number ‘Make Our Garden Grow’. In the time-honored Broadway tradition, the pit band played on during the final curtain calls, even though the music was nearly drowned out by thunderous ovation from the capacity crowd. For many, it was the best of all possible nights at the opera.